At the Scene of the Crime: How long have you been a lonely guy? How long have you been a lonely guy? 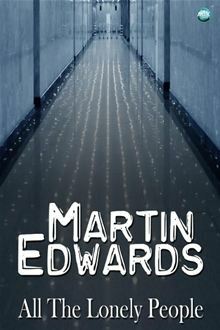 I have been a reader of Martin Edwards’ excellent blog, Do You Write Under Your Own Name?, for quite some time. I can’t recall when I started to read it, but it was one of the first blogs to make it onto my blogroll. His blog is literally one of the very best mystery blogs on the Internet; he shows great admiration and respect for masters of the form, both past and present, such as Agatha Christie, John Dickson Carr, or Peter Lovesey. But much to my shame, I had not read any of Martin’s books. The shame was only compounded when a fellow blogger, PuzzleDoctor, began to review Martin’s books on his own excellent blog. The praise was consistent and recommendations were handed out as freely as Hallowe’en candy. I finally visited my Amazon shopping cart and added All the Lonely People to my digital cart, purchasing it for my Kindle. Why All the Lonely People? 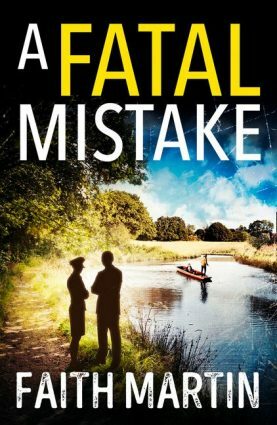 Well, the Doc’s praise was of the very highest calibre: “this is one of the best mystery novels that I’ve read in ages” he declared. And you could tell that he meant every word of it. So I eagerly began to read, hoping that I would see the same things in this book. Harry Devlin is a solicitor in Liverpool, the city everyone seems to love to hate. One night when he gets back home, his ex-wife Liz is waiting for him. Well, to be technical, she’s his wife—they never bothered with the formality of divorce—but they have been very much apart for the last two years. Liz tells Harry that she is leaving Michael Coghlan, the man she left Harry for, and confesses that Coghlan scares her. She fears for her life. Harry wasn’t born yesterday and knows that he’s the prime suspect. But he can’t understand why the police aren’t going after Coghlan, who must have been the real killer. And so he determines to find Coghlan on his own and figure out if Coghland really did kill Liz. If not Coghlan, who did murder her? And why did Liz have to die? 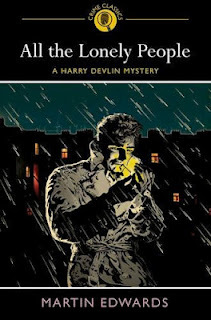 That is the plot of All the Lonely People, a book that is, in a word, outstanding.I am genuinely surprised that this was Martin Edwards’ first published effort—it reads like that of a seasoned pro’s. Although the book has quite a hardboiled edge to it, Edwards successfully blends this style with very traditional plotting. The reader gets every scrap of information needed to solve the crime, along with Harry. The plot twists and turns multiple times and there are several red herrings that derail both Harry and the reader. Ultimately, the book ended up fooling me in its denouement, but it was satisfying to see everything explained, including the thought processes that lead Harry to his wife’s killer. While sharp readers might spot the killer before Harry, I personally did not. Meanwhile, the writing is just terrific. I have no idea how the author managed to do it, but every character here feels like an individual. You really can almost physically feel Harry’s pain and confusion when Liz is murdered. The sense of loss, the grief, not wanting to let go of the past: it all feels authentic. Even though the police are on the wrong track, they don’t feel like a sadistic group of incompetents, but just a bunch of weary guys who have a job to do and don’t always like doing it. Meanwhile, an aura of loneliness hangs over the entire novel. By this I don’t mean it’s some depressing, noir-ish book populated by nasty characters. I mean simply that loneliness is a major theme and hangs over the characters like a thick fog. Harry has been lonely for two years, and eagerly grasps at the remote chance of reconciliation with Liz, only to have the opportunity violently snatched away from him. What is it that motives his hunt for the killer? I think it’s not so much desire for private revenge so much as a hatred of the loneliness that Liz’s murder has thrown him into. 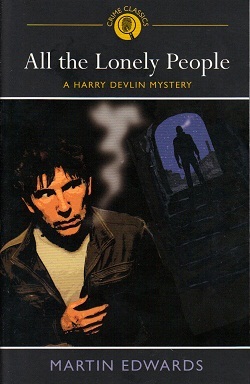 Throughout the book, the image of Liz haunts Harry, and he meets several people who, like him, are lonely, hence the title All the Lonely People. Some, like Harry’s neighbour Brenda, whose husband left her, have been abandoned by those close to them. Others, like the homeless scavangers at a garbage dump, have been abandoned by society. But whatever their reasons for being lonely, they are united, in an odd way, by this decidedly undesirable emotion/condition. Hopefully I haven’t given too much away of this extraordinary book. It’s a good mystery, but when considered as a debut, it is absolutely phenomenal. Many of the flaws associated with first-time mysteries are simply not present, and the book feels like it has been written by someone with plenty of experience. It’s truly an outstanding achievement, and without a doubt one of the finest mysteries I’ve read this year: great characters, terrific writing and atmosphere, and a very good plot indeed. It comes highly recommended. 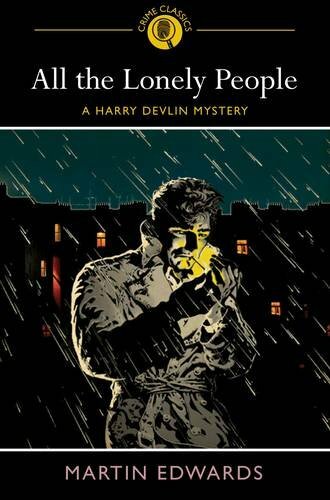 Notes: The Kindle edition of All the Lonely People comes with a few bonus features, including an introduction by Frances Fyfield (which can be safely read before the book). After the book is finished, some more bonus features appear, including a retrospective look at the book by the author and an article by Michael Jecks entitled “Martin Edwards: An Appreciation”. The Kindle edition is well-formatted and the editing is for the most part decent. The post title is a reference to a terrific little black comedy starring Steve Martin, The Lonely Guy. While it’s a fairly flawed movie, it does a good job at portraying the central character’s loneliness, and to be perfectly frank, it’s my favourite movie to watch come Valentine’s Day. So glad you enjoyed this, Patrick. And you're right, it is an astounding first novel. I wouldn't call it astounding but it's very enjoyable, as is the whole series and Martin's other series, set in the British Lakes. I judge first novels a little differently than other entries in a series. First novels in a series tend to have things in them that subsequent entries will skip over, such as introducing characters for the first time. So I'm always a bit more lenient to them. Considered as a mystery, it's pretty good-- but when you factor in that this is a fiction debut, as well as a first novel in a series, I think the achievement truly is outstanding. I'm very grateful for this generous review. One thing I've always tried to do is to write stories that will - whatever their flaws - stand up reasonably well to the test of time. So it's heartening to see that this debut effort still has appeal. I like to think I've improved as a writer over the years, but the early Devlin novels occupy a special place in my affections. Thank you, Patrick.